The community responsible for developing lexicons for Natural Language Processing (NLP) and Machine Readable Dictionaries (MRDs) started their ISO standardization activities in 2003. 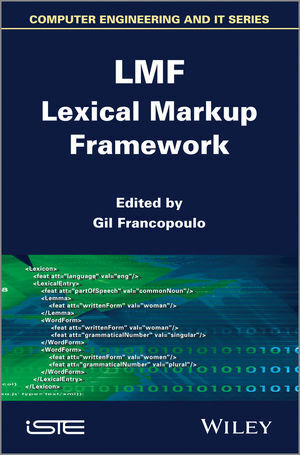 These activities resulted in the ISO standard – Lexical Markup Framework (LMF). 1. LMF – Historical Context and Perspectives, Nicoletta Calzolari, Monica Monachini and Claudia Soria. 2. Model Description, Gil Francopoulo and Monte George. 3. LMF and the Data Category Registry: Principles and Application, Menzo Windhouwer and Sue Ellen Wright. 4. Wordnet-LMF: A Standard Representation for Multilingual Wordnets, Piek Vossen, Claudia Soria and Monica Monachini. 5. Prolmf: A Multilingual Dictionary of Proper Names and their Relations, Denis Maurel, Béatrice Bouchou-Markhoff. 6. LMF for Arabic, Aida Khemakhem, Bilel Gargouri, Kais Haddar and Abdelmajid Ben Hamadou. 7. LMF for a Selection of African Languages, Chantal Enguehard and Mathieu Mangeot. 8. LMF and its Implementation in Some Asian Languages, Takenobu Tokunaga, Sophia Y.M. Lee, Virach Sornlertlamvanich, Kiyoaki Shirai, Shu-Kai Hsieh and Chu-Ren Huang. 9. DUELME: Dutch Electronic Lexicon of Multiword Expressions, Jan Odijk. 10. UBY-LMF – Exploring the Boundaries of Language-Independent Lexicon Models, Judith Eckle-Kohler, Iryna Gurevych, Silvana Hartmann, Michael Matuschek and Christian M. Meyer. 11. Conversion of Lexicon-Grammar Tables to LMF: Application to French, Éric Laporte, Elsa Tolone and Matthieu Constant. 12. Collaborative Tools: From Wiktionary to LMF, for Synchronic and Diachronic Language Data, Thierry Declerck, Pirsoka Lendvai and Karlheinz Mörth. 13. LMF Experiments on Format Conversions for Resource Merging: Converters and Problems, Marta Villegas, Muntsa Padró and Núria Bel. 14. LMF as a Foundation for Servicized Lexical Resources, Yoshihiko Hayashi, Monica Monachini, Bora Savas, Claudia Soria and Nicoletta Calzolari. 15. Creating a Serialization of LMF: The Experience of the RELISH Project, Menzo Windhouwer, Justin Petro, Irina Nevskaya, Sebastian Drude, Helen Aristar-Dry and Jost Gippert. 16. Global Atlas: Proper Nouns, From Wikipedia to LMF, Gil Francopoulo, Frédéric Marcoul, David Causse and Grégory Piparo. 17. LMF in U.S. Government Language Resource Management, Monte George. Gil Francopoulo works for Tagmatica (www.tagmatica.com), a company specializing in software development in the field of linguistics and documentation in the semantic web, in Paris, France, as well as for Spotter (www.spotter.com), a company specializing in media and social media analytics. Gil Francopoulo works for Tagmatica (www.tagmatica.com), a company specializing in software development in the field of linguistics and documentation in the semantic web, in Paris, France, as well as for Spotter (www.spotter.com), a company specializing in eReputation computation and text mining.